Runtime:138 min Rated PG (Canada), Rated PG-13 (MPAA) for intense and bloody depiction of the Crucifixion, and for some sequences of violence. 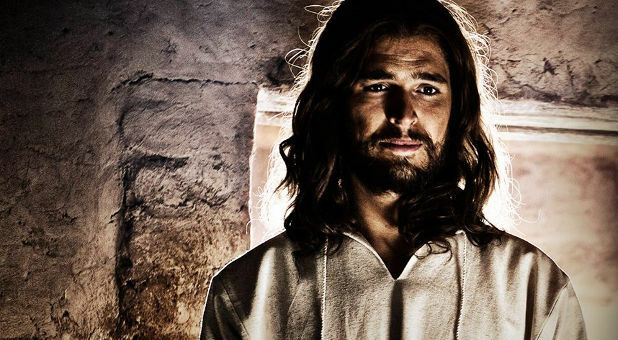 Director Christopher Spencer and lead editor Robert Hall took material from five episodes of the television mini-series The Bible and edited it into Son of God for theatrical release. As a result the film is much shorter with a 138-minute running time. To achieve this, Spence and Hall made some measured editing choices some of which are successful. For instance, one smart choice was to take out the mini-series' problematic narrator and present Son of God as a more straight-forward docudrama framing the film with Saint John, the writer of the Gospel of John and the Book of Revelation. Spencer and Hall, who worked together on the mini-series, start Son of God on what looks like solid ground. The opening sequence is promising as it's derived from the first words of John’s gospel: "In the beginning was the Word." It then takes scenes from the Old Testament parts of the mini-series and presents them in a rather insightful way: The Word was with God and is God and was with Adam and Eve in the Garden; with Noah and his family in the Ark during the flood; with Abraham when Abraham was chosen; was with the descendants of Abraham - the Children of Israel - in the Exodus out of Egypt; and with them in the conquest of the Holy Land — right up to the Word being incarnate in Jesus the Son of God. This may be one of the film’s most positive elements. However, the rest of the film doesn't bear out consistently this way of thinking. The film is bookended with Saint John,starting and ending with him living in a cave on the Island of Patmos where he seems to be in some sort of spiritual distress, a plot device designed to sling-shot the viewer into the narrative with a little a dramatic crisis. Where this framing could have been excellent and in some ways works, it starts breaking down because it's based on a purely speculative opinion about John's inner spiritual life. Here's the problem: as one of Jesus' original twelve disciples, John could have suffered this sort of spiritual distress in the days between Jesus' death and resurrection. However, scripturally speaking, on the Island of Patmos John had the resurrected Jesus' promise spoken to him on the day of ascension when Jesus says, "behold,I am with you always,to the end of the age.” So whether baptising and teaching in Jesus' name or exiled on the Island of Patmos, John would have known Jesus was with him. 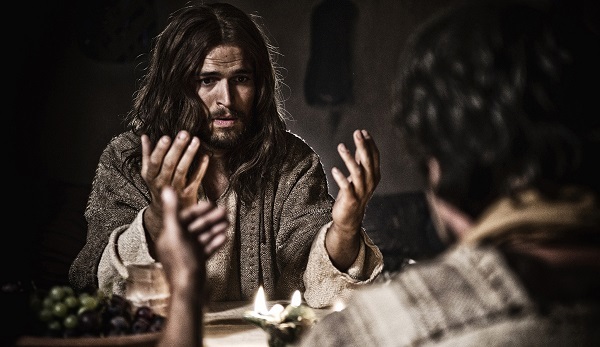 The indication in Son of God is that John is not so sure about whether Jesus is with him. As a result, at the end of the film John is excited when Jesus appears to him outside his cave on Patmos. Before Jesus reveals Himself to the aging disciple, John is shown lamenting that all the other faithful disciples havebeen martyred except him and are now with Jesus; he feels left out. It's as if John had no comfort in the promises of Jesus! "When the Holy Spirit comes to you, you'll receive power. The power of the Holy Spirit can be with you all wherever you are. Go in to the world and preach the gospel to all creation. Peace be with you." These words are patched together from two Biblical sources: First, Mark 16:15 where Jesus says, “Go into all the world and proclaim the gospel to the whole creation." Second, from the Acts of the Apostles 1:8 where at His ascension Jesus says, "you will receive power when the Holy Spirit has come upon you." What's missing? Baptism! In the Gospel of Matthew’s account of the ascension Jesus says, “All authority in heaven and on earth has been given to Me. Go therefore and make disciples of all nations, baptizing them in the name of the Father and of the Son and of the Holy Spirit, teaching them to observe all that I have commanded you. And behold, I Am with you always, to the end of the age.” Matthew’s gospel clearly includes baptism in the ascension. Since it appears Spencer and his other writers didn't choose the Gospel of Matthew as the text upon which to base the film’s ascension scene, there's no mention of baptism. That’s their prerogative as there are other accounts of the ascension. But there's an additional problem. While Mark 16:15 says “Go into all the world and proclaim the gospel to the whole creation," - which the film makers have clearly used as inspiration for their scripted line - the text of Mark’s Gospel doesn't end there. In the next verse Jesus says, "Whoever believes and is baptized will be saved, but whoever does not believe will be condemned." Mark in the Gospel of Mark clearly includes baptism in his account. It appears the makers of Son of God simply didn't choose the whole of St. Mark’s account either as the text to base the film's ascension scene on and have clearly given priority to the Acts of the Apostles’ record which doesn't talk about baptism specifically. Therefore, there's no mention of baptism in the ascension scene of Son of God. The trouble is that The Acts of the Apostles (Acts), the sequel to the Gospel of Luke, describes the Apostles baptizing in Jesus' name. In fact, ten days after the Ascension, the book of Acts records three thousand people baptized on the day of Pentecost. This is internal evidence to the mission of the disciples who were present at the ascension of Jesus. As a result of their alterations and deviations from Scripture, the makers of Son of God leave the viewer with two things: First, a baptism-sized hole in the ascension of Jesus and second, the absence of Jesus' promise "behold, I Am with you always, to the end of the age.” These are only two examples of choices made by the makers of Son of God, and since it's impossible to get into the minds of the writers to understand the reasons for their changes without them speaking directly to those changes there will undoubtedly be viewers left with puzzling unanswered questions. Son of God is what it is, and it's now out there in the world. The question then is: What is a Christian to do with this film? 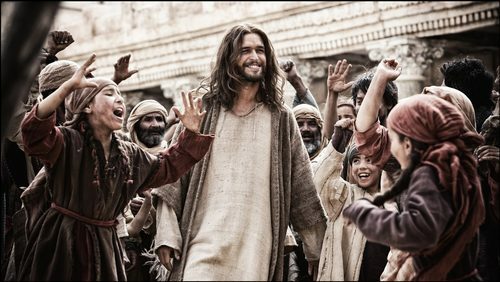 Are Christians obliged to praise it because it's a film about Jesus? The honest thing is to say that it's not a very good movie as far as movies go. There are better films about Jesus: The Gospel According to St. Matthew (1964) by Pier Paolo Pasolini or Jesus of Nazareth (1977) by Franco Zeffirellia reverent film about Jesus which also started its life as television mini-series. Even Mel Gibson's The Passion of the Christ (2004) with all its oddities is a better film than Son of God.It's also important to note there are worse films about Jesus too, notably the largely forgettable and Papal-approved television movie Jesus (1999) by Roger Young starting Jeremy Sisto. Perhaps the worst from a Christian perspective would be Martin Scorsese’s film The Last Temptation of Christ (1988) based on the book of the same name, in which Jesus is not portrayed as God but rather as a man suffering from a psychological disorder. Son of Godfalls somewhere between these extremes. As fanboys and fangirls lose their marbles over changes and additions to the text of The Hobbit in the Peter Jackson film trilogy, we need to ask the question: What's more important, fidelity to the text of J.R.R Tolkien's The Hobbit or fidelity to the text of the Bible? Which should Christian viewers be more bent out of shape about? 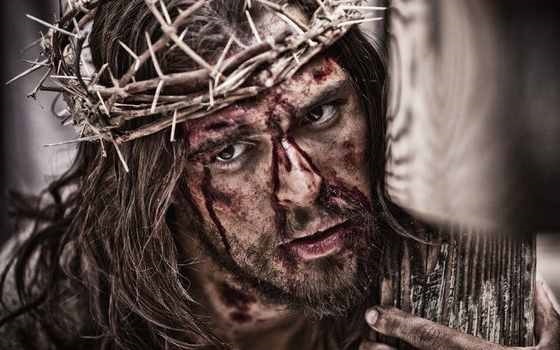 The makers of Son of God clearly paint Jesus as the Son of God despite taking many liberties with the text of Scripture. Viewers, whether Christian or not, would be best served by doing some fact checking either before or after watching the film. Regardless of a person's spiritual beliefs, going to the source material provides the most clarity and truly authentic insights. The old adage is proved true yet again, "The book is better than the movie." If Son of God encourages people to check out the book it may have a positive impact but by itself, Son of Godis not the best filmic witness to the true Biblical accounts of Jesus' life, death, resurrection and ascension. Although some will use the film to spark further study, as it stands Son of Godis not a one-stop shop for either the faithful Christian or the spiritually-interested viewer. 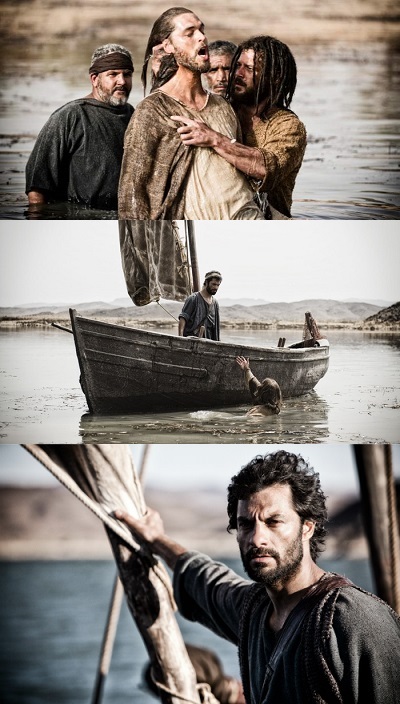 Hope, Mission, Betrayal, Passion, Courage: Episodes 6 to 10 of The Bible (2013 TV Mini-Series).